No artwork this week but I wanted to show you how I organize my stamp sets. If you have more than a handful, it is very helpful to have some type of system that works for you. This is what works for me. These printed sheets go into a 3-ring binder which is sorted by category. You can use whatever works best for you. My current categories are: Alphabets, Sentiments, Flowers, Misc. Within the misc. section I have birthday, borders, and other themes together. I plan to update this with more dividers like kids, birthday, animals, borders, backgrounds, etc. Right now those stamps are together, I just don’t have a tab for easy reference. Then the actual stamp sets themselves are stored in alphabetical order. So I can look through my book to find a stamp and and look up the set by the name of it. This also allows me to quickly access stamp sets that I use often and know the names of off the top of my head. You will see I also have the drawers labeled. There is really no reason for this other than to keep my drawers in order when I pull them out. I thought about marking which drawer each stamp set was in but because I have so many stamp sets that come and go I didn’t want to bother with this because some may move to different drawers and I felt it was too time consuming to keep up with a system like that. 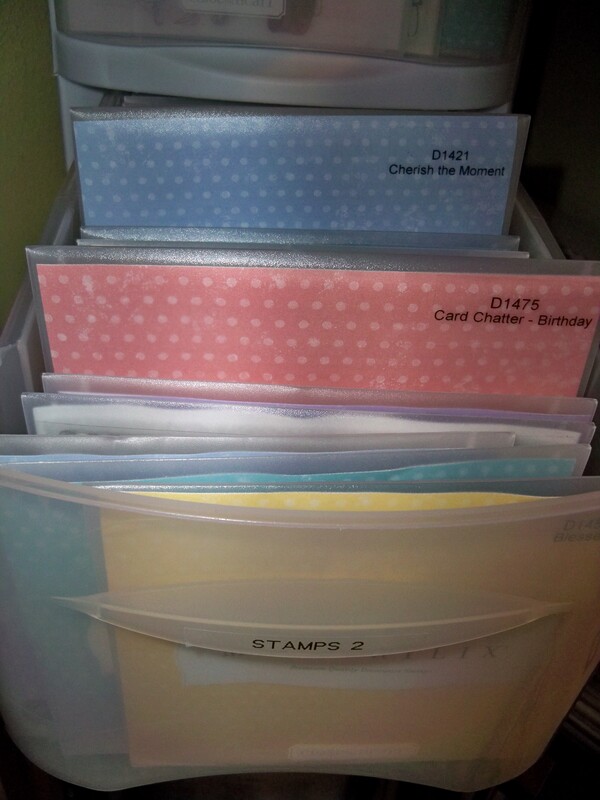 This My Acrylix Organizer also works well if you have a smaller amount of stamps. These also stack well on top of each other. Once you have a system in place you need to use it and keep it updated. Every time I get a new stamp set, I need to remember to photocopy it and add it to my book. 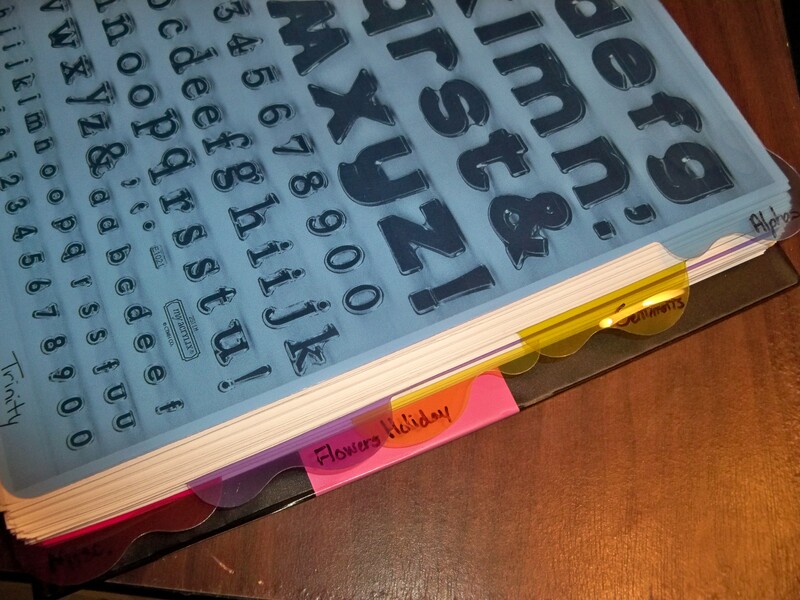 Every time I get rid of a stamp set, I need to remember to take the copy out of my book. I hope this has helped you and maybe given you some ideas. The main thing is to find something that works best for you so that you are using your stamps and not just letting them sit because you don’t know what you have. Update: In answer to Juliana’s question, the only Close to My Heart stamp sets that I have that don’t have names are the ones that come in the Workshop Kits and I think their technically called by the name of the workshop so that’s what I use. I write the name (ex. Pemberley) with permanent marker on the envelope where the name would normally appear. I do the same with the Stamp of the Month sets, they are sorted by name. I don’t mark these as SOTM because they sometimes show up in a later Idea Book as a regular stamp set. The few stamps I have that are not CTMH are stored in a basket on top of my tower. This is as far as this organization goes because it’s easy enough to look through them and I know from the copy in my binder that they are non-CTMH.